Days of Our Lives spoilers tease that Ben Weston (Robert Scott Wilson) and Chad DiMera (Billy Flynn) will team up to find and rescue Ciara Brady (Victoria Konefal), who by the time they find her, will be in danger of being consumed by flames! Ben runs into Chad, who is looking for baby Charlotte (Chloe Teperman) and they team up to look for Ciara, likely after Abigail DiMera (Kate Mansi) calls Chad to notify him that Jordan Ridgeway (Chrishell Hartley) has returned the baby, or Chad may not be aware and Ben will have told him Jordan probably has Charlotte as well as Ciara. This will be after Jordan will have made sure that Ben was in custody, having framed him beforehand by planting Ciara’s cell phone and Charlotte’s baby blanket in his hotel room. According to Robert Scott Wilson, quoted in the most recent Soap Opera Digest under “late breaking news”, Ben will have questioned his sanity at first, thinking his couple of missed doses of his medications could have caused him to have committed the crimes while blacked out; but then while in custody he puts the pieces together and realizes his sister must have framed him. He then escapes police custody by overpowering Eli Grant (Lamon Archey) and forces Hope Brady (Kristian Alfonso) to leave the station with her, begging her to help him rescue Ciara from Jordan, but his pleas fall on deaf ears. Ted Laurent (Gilles Marini) intercepts them, and Hope is freed, but Ben gets away. After this, he runs into Chad. By the time Chad and Ben arrive at the cabin, it is in flames, Jordan having set it on fire with Ciara in it to make sure she doesn’t identify her, and having taken Charlotte with her to return to Abby. 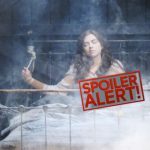 Days of Our Lives spoilers tease Hope shows up at the cabin in time to see Ciara being carried through the smoke by Ben; the spoilers are unclear how she knows to go there, but there is a happy ending and a reunion of mother and daughter for the time being, and Ciara is taken to the hospital to make sure she is okay. Stay tuned to Days of Our Lives and keep checking Days of Our Lives Spoilers frequently to see all the exciting developments during February sweeps!